KADAVU, FIJI ISLANDS – 22 September 2009 – Matava – Fiji’s Premier Eco-Adventure Resort is proud to be named as one of the world’s Ultimate Eco Escapes by SPORT DIVER Magazine, the official publication of PADI Diving Society’s in September 2009 issue. Sport Diver Magazine is the official publication of the PADI Diving Society and is one of the largest dive publications in the world. Sport Diver Magazine is the official publication of the PADI Diving Society in the Americas, published by Bonnier Corporation. PADI Diving Society is a lifestyle organization for people who love the water. Whether you’re a dedicated snorkeler or avid diver, beginner or pro, the PADI Diving Society will help you get the most from your active aquatic lifestyle. 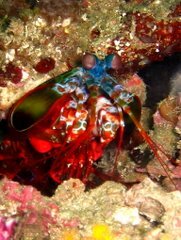 Mad Fish Dive Centre is our on-site PADI Dive Centre offering the best of diving in the South Pacific.